attention back in 2001 with his told backwards movie Memento. He then moved on to remaking a Swedish movie called Insomnia. He then brought the real Batman to the screen twice with Batman Begins and The Dark Knight. 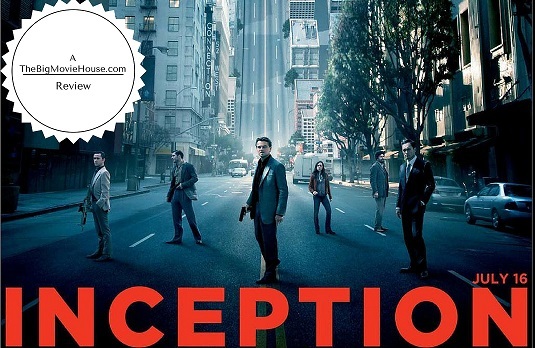 Following the huge success of The Dark Knight, Nolan has brought us the very high concept movie Inception. This is a movie that deals with dreams, but more importantly, how we precieve dreams and reality. The movie stars Leonardo DiCaprio as a dream stealer. He is able to go into people's dreams and steal almost anything from them. As the movie begins, he is proving his abilities to a potential client. This scene sets up what will become the climax of the movie. DiCaprio is good at what he does, but the client is able to tell what is the dream and what isn't. This too comes into play later. The client, the always great Ken Watannbe, has an offer for DiCaprio and his crew. The client wants DiCaprio to plant an idea into someone's mind, so that the person believes that he came up with it. This, according to the movie, is called Inception (hence the name of the movie. We are told that Inception is very hard to do, but DiCaprio has done it before so he takes the job. The setup and execution of said inception takes up the majority of the movie. The movie acutally plays out like a heist movie even though they are trying to put something in rather than taking something out. The inception involves dream-within-a-dream-within-a-dream type sceneiors. While the inception is going on there are a bunch of other things happening as well, but despite all of these plot strains the movie is pretty easy to follow. The screenplay by Nolan is incredibly rich and detailed. Also the movie goes in directions that you won't see coming so there is always a surprise. The acting is top notch and the directing is classy. The only problem I had was with the movie so much as with the trailer. Warner Brothers put a lot of money and faith into this movie so you would expect them to give us a trailer that leaves us wanting more. This they succeed at, but they make the movie seem more like an action movie than it really is. The movie is filled with action scenes but not the type you would expect from a movie like this. The trailer gives the impression of things that don't happen in the movie. This I was very happy with because I feared that the movie was going to head down the path of a straight out action movie while forgetting what it has established before. I just wish that Warner had marketed this movie more to the thinking crowd and less to the action crowd. Inception is one of the best movies of the year and will become one of those movies that everyone will be talking about.